Peter Lamprey writes that they are off operations as their rear gunner is ill. The wing commander has been unable to find a replacement so Peter has taken advantage and gone out on the town. He concludes with catching up with friends’ news and friendly banter. Waterlow & Son’s [sic]. Ltd.
You will no doubt be pleased to hear that so far I have managed to dodge the column on the last two efforts. The rear-gunner has developed a bad attack of boils and cold feet and is now in dock. So, for a day or two, we are on our spines cheering the brave boys as they take off for adventures unknown. How long this admirable state of affairs will last is doubtful as the Wing-Commander has been appologising [sic] to the skipper for being unable to find us another R.G. He says he is looking for another but they are unfortunately (?) in short supply. I wish to hell he wouldn’t be so keen, this sort of operating is all I want until the supply of sticky targets run out. There is no future in these Berlin trips and a few more like the last will not only see the end of Berlin but the end of Bomber Command. However with my inherent adaptability I am making the best of a bad job. This means going to town at every available opportunity. The beer round this quarter is not so hot but the women make up the deficiencies. With the dark nights setting in, one can get down to business and still catch the bus back. The speed with which some of them get their trousers down shows a wonderful intuition into the wants of us poor aircrew. I am sorely afraid that if we lay off flying much longer they will have to lift me into the kite the next time I go. Either that or be driven in with a gun. The N.F.S. have a big training centre here and are the girls well trained or are they? can be cancelled. Mr Hunt had to curtail his holiday I suppose to get in on the half-night’s overtime? That would, of course, be the one occasion when he was well in evidence and getting in the old mans [sic] way. Cherry Ransom is evidently grasping the facts of life fairly well and seems to be doing himself a bit of good. If he can only fall sick very time an overseas draft appears over the horizon he should live in comfort and luxury until I get this war finished. I must get the skipper to put the kite down at Sutton Bridge one morning when we are air testing and have a look at one of my most successful pupils. As for Mr. Maloney: I can almost hear the choppers whistling for him. When they fall he will be overseas so fast he will never know he had a rest in England. Charlie – I should imagine – has got an injury that, with care, should keep him sick for the duration. It isn’t given to every man to have these opportunities and he should do right by the chance. Cocky Warren seems to have got this war taped and if he is a bit nippy with his footwork the only chance of overseas service will be if they torpedo [deleted] e [/deleted] England and he takes to the boats. a bit more of the essentials of life. Don’t let this stampede anybody into joining this racket however. The path to the exalted position I now occupy is long and stony and I am afraid all the best members of the chapel are in this squadron. Should Bro. G. really insist on coming in I am ready to give him a few lessons on the rifle and modern tactics so that the old firm will put up a fair show. Hoping this finds you as it leaves me at present, doing F.A. and happy. Remember me to all at home. 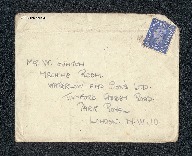 “Letter from Peter Lamprey to W Gunton,” IBCC Digital Archive, accessed April 20, 2019, https://ibccdigitalarchive.lincoln.ac.uk/omeka/collections/document/6616.